Looks good, feels well built. Controls are not very well labelled. Priced at around the £90 mark is the Samsung ME89F-1SS - offering a substantial 23 litre capacity, 800w of power and a fairly stylish design. Cooking is pretty even and uniform, thanks to Samsung's Triple Distribution System - which means the food is cooked from three angles as opposed to one. The interior is ceramic enamel for easy cleaning, and overall the design looks pretty stylish. The exterior is silver in colour, and should fit in with the majority of kitchen colour schemes. Unfortunately the controls are not very well labelled - with symbols instead of text, and so the average user may find this microwave a little confusing to operate at first. The digital display is pretty clear, and easy to read even in brightly lit environments. Overall build quality of this silver microwave oven feels pretty good, and as though it will put up with daily use. Overall the ME89F-1SS is a well made microwave, which apart from the poorly thought out controls, performs pretty well. 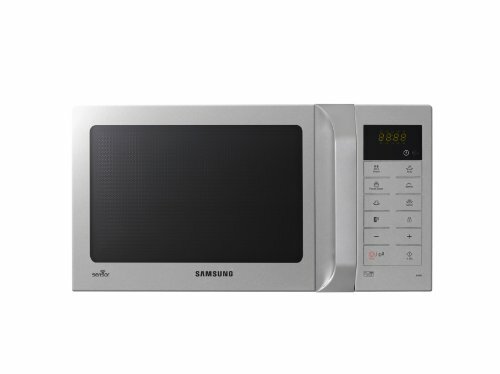 I am looking for a solo microwave that will take a 29cm plate, so perhaps minimum turntable of 28.5cm? This information is not always available on the review descriptions. 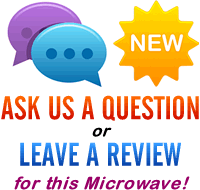 Hi Liz – We have a dedicated section for large solo microwaves – you should be able to find a model within there (or even in our mid sized microwaves) which will fit your criteria!